As a young mom, I was eager to find parenting advice and help. I read dozens of books, consulted other parents, and quizzed the pediatrician. I was certain there was something out there I hadn't yet tried. And while some of the advice proved useful, most days I simply faced parenting challenges empty-handed and helpless. Friends of mine and I now joke that when other moms ask us what they should do with their parenting dilemmas, we say we have no idea. After all these years parenting, we've got nothing. In some ways, we are cynical; in others, realistic. The truth is, parenthood is humbling. It brings us all to our knees. We realize raising children is not a math problem we can solve with a simple formula. These days, I turn to prayer more and more. I cry out to the Lord for help and hope. I ask him for wisdom in my parenting and above all, to work in my children's lives and hearts. Perhaps you are facing your own season of helplessness in parenthood. Perhaps you've sought advice, read all the books, and tried each and every solution and method. There are many helpful tips for parenting and certainly many good things we can and should do for our children. Certainly, they need a healthy diet, physical activity, and rest. They need structure and routine, clear rules and consequences. But ultimately, what our children need most is the Spirit to work in their hearts. Here's a prayer I have often prayed for my own children, perhaps it can provide encouragement for your own prayers. You are my Father. What a privilege it is to call you that! Through faith in Christ, I have been adopted as your child. I have all the rights and benefits of being part of your family. I can come to you at all times and in all places and tell you what's on my heart. Thank you for making that possible through the death of your Son. I come to you now with a burdened heart. A weary heart. A heavy heart. Parenting is hard. Just when I think I know what I'm doing, something changes and I need to learn something new. Some days I wonder if I'll ever feel confident in my parenting. But maybe that's the point. Maybe I'm not supposed to be confident in my methods and strategies. Maybe those methods aren't supposed to always "work." Maybe parenting is supposed to keep me on my toes because instead of trusting in what I am doing as a parent, I need to trust in you. Maybe parenting is hard so that I would learn to depend and rely upon you and your Spirit at work in my life and in the life of my children. Father, I bring my children before you. They are covenant children and enjoy all the rich benefits of being a part of the church, of hearing the word preached each week, of having other adults pour into their lives, of learning and memorizing your word. I pray you would ratify the covenant in them. Bring them from death to life by the power of your Spirit. Open their minds and hearts to see their need for Jesus. Convict them of sin and draw them to repentance. Help them to love you with all their heart, mind, soul, and strength. Be at work in them, refining and shaping them into the image of Christ. Protect their minds and hearts from evil and may they never know a day when they did not know you as Lord of their lives. May Jesus be their greatest treasure. I pray for my parenting decisions and responses. Help me to parent out of your wisdom. Help me to seek your glory. Help me to speak the truth in love, point my children to Christ, teach and discipline them according to your word, and love them as you have loved me. Help me not to fret, worry, or fear. Help me not to despair. Help me not to react. Instead, help me to trust and rest in you and the power of the gospel at work in me. Help me to be quick to repent, slow to anger, and generous with love and affection. Good things happen while we wait. It took time for these precious souls to be knitted in the womb and what joy I felt at their arrival. May I be patient as I wait for the work you are doing in their hearts. Help me to watch with hope and trust. Help me to see and trace the evidence of your grace at work in their hearts. Help me to glory in your goodness and faithfulness in Christ. Please hear all these cries of my heart. Because of and through Jesus I pray, Amen. 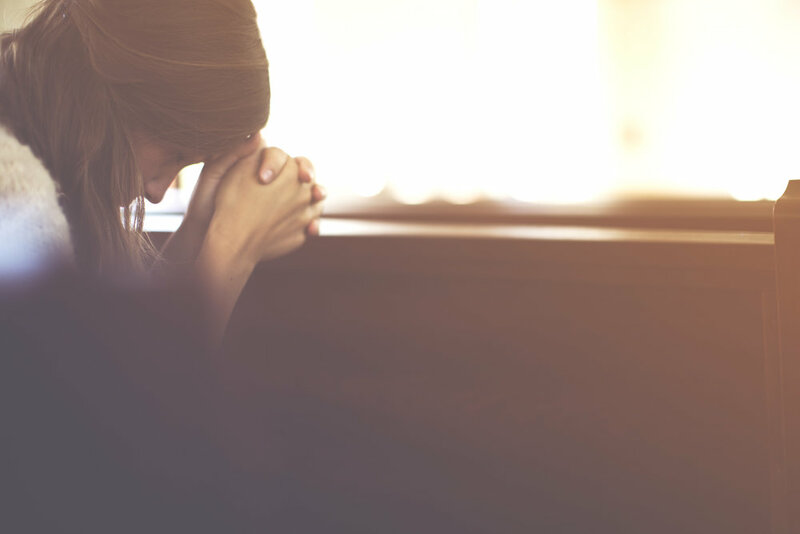 If you read my post last week on seeking God's will in making decisions, you may remember that one of the steps to making a decision is to seek God in prayer. Perhaps you are in the midst of a difficult decision right now. If so, this prayer is for you. I come before you today with my mind swirling with different thoughts and feelings. I have a hard decision make and I just don't know what to do. I feel helpless and confused. I'm worried about the consequences to my decision. I worry about the impact my decision will have not only on myself but on others as well. To be honest, I fear making the wrong decision. Your word tells me that if I seek after wisdom you will provide it. So I am seeking you, the source and fountain of wisdom. You've written everything you want me to know if the pages of your book, The Bible. I pray that as I read your word, it would shape my wants and desires and longings. I pray that it would impress on me what matters most to you. I pray that as I consider the decision before me, that I would remember what your word teaches about your sovereignty and control over all things. You know this problem before me. You know how it turns out. That's because you are the Alpha and the Omega. You know the end from the beginning. Nothing happens apart from your will and plan. Not only are you sovereign, but you are good. All your plans are holy, righteous, and good. I can trust that you know what is best for me. When I move forward with this decision, I know that it is your will and that you will use it for my good and your glory. Forgive me for getting caught up in wanting to know the future and how everything turns out. Forgive me for treating you like a "magic 8 ball." Forgive me for fearing the future and for waiting around in the hopes that the answer will be written on the wall. Help me to rest and trust in who you are. Help me to look to Jesus, knowing that if you gave of your own Son to save me from sin, how will you not also be with me in all the challenges and decisions of my life? There is nothing and no one that can separate me from you; I have nothing to fear. Some days our plans just don't come to fruition. All that we expected and looked forward to goes awry. We struggle and push forward only to fall back down again. The world tells us that we can do whatever we put our mind to do. If we wish hard enough, we can click our heels and end up wherever our heart desires most. There are some Christians who say the same thing, that Jesus is our spiritual candy machine, dispensing dreams and hopes at the push of a prayer. They say that God wants us to be happy and wants us to have everything we've ever wanted. We just need to believe and pray harder. But the reality of our Christian life speaks otherwise. Disappointment is part of life in this fallen world. Things don't work the way they are supposed to. People let us down. Hard things happen. As believers, we shouldn't be surprised when things don't work out, when we face difficulty, or when life is disappointing. That's because Adam fell into sin, we all fell into sin. The imprint of sin is on everything. Even the earth itself groans with the weight of it. We apply for a job and are told we aren't qualified. We work hard for a promotion only to have someone else get it. We've turned thirty and there's no ring on our finger. We finally have enough money to buy our first house, only to be outbid by someone else. The pregnancy test comes back negative. We feel left out of community in our church. Our children struggle in school, choose the wrong friends, or have no interest in spiritual things. The ministry we've worked so hard to create never gets off the ground. Indeed, the list of disappointments in this life are too many to count. But there's gospel hope even in the midst of our disappointments. As Jesus said, “In this world you will have sorrow, but take heart, I have overcome the world” (John 16:33). Jesus said we will have sorrow. We will have disappointments and heartaches. Anyone who tells us otherwise is preaching a false gospel. But Jesus also pointed to our hope, "I have overcome the world." The disappointments of life in this fallen world remind us that our Savior has come. He has fought sin and death and won. He broke the power of sin, cancelled our debts, and secured our eternity with him. Our hope and joy and contentment are not found in the things of this world but in Christ and what he has accomplished for us. In fact, these disappointments we experience rather than being walls we can't climb, instead become doorways to something else entirely. They become opportunities for change. The change we need most: heart change. They are opportunities to draw near to God, to seek his face, and to find him as the greatest desire of our heart. God is preparing us now, in this life, for eternity. He uses our struggles and challenges to sanctify us and make us holy. He is making us increasingly more like Christ by stripping away the layers of sin and removing the counterfeit loves in our heart. So when disappointments come, we can ask ourselves, "What might God be doing?" "What do I need to learn from this?" "How can I seek him in this?" And rather than despair over our disappointments, we can remember that what disappoints us now will in the end make us more like our Savior (James 1:2-4). Is life disappointing you today? Cry out to God in prayer. I come before you with a heart weighed down by disappointments. Life hasn’t turned out like I expected. I feel let down, like I’ve been failed in some way. I don't know what to do with these disappointments. Part of me wants to complain, part of me wants to give up in despair, and part of me wonders, Why do I even bother? I guess my question is, Why is life so disappointing? Why can't anything go the way it should? Why can’t I make any headway? Will I ever reach my goals or see an end to these constant uphill battles? Yet even as I ask these questions, your Spirit prompts me in remembrance of your word. I know why life is disappointing. I know that it’s not supposed to be this way. You created everything to work together in perfect harmony. But ever since that day when my first parents ate the fruit you told them not to eat, life has been marred and broken by sin. Disappointments rule the day. Everything from the earth itself, to my body, to relationships, to my dreams, they all fail to work the way they are supposed to. Father, forgive me for complaining about my situation. Forgive me for wallowing in my self-pity. Forgive me for my discontentment. Yes, I know why life is disappointing and I should not be surprised. But what do I with those disappointments? How do I wake up every day knowing that life will not work the way it is supposed to and that a struggle or trial will appear at some time in my future? Your Spirit prompts me again and I remember your Son. The Man of Sorrows. He knew the disappointments of this life. Your word says, "He was despised and rejected by men; a man of sorrows, and acquainted with grief; and as one from whom men hide their faces he was despised, and we esteemed him not" (Isaiah 53:3). He willingly entered this dark world, filled with brokenness, pain, sin, and sorrow. He took on the same weak flesh that I wear. He experienced everything I experience. Yet he did not sin. He did what I cannot do. He woke up every morning knowing that it was one day closer to the day he would give up his life for me and he willingly took those steps forward. For me. And then when the time had come, he took on all my sin at the cross, suffering the curse I deserved. In that moment, he reversed the curse that started the day Eve bit into the flesh of that forbidden fruit. I thank you Father for providing a way out of that curse. I thank you that because of your Son, I have the hope of heaven and eternity with you forever. I long for the day when all things will be restored to its rightful place, where there will be no more disappointments and sorrows and I'll be finally freed of my sin forever. Until then, I live in this in-between time, where Jesus has won the victory but skirmishes still remain. Though he has conquered the power of sin in my life, the presence of sin still remains. Disappointments remain. I continue to face trials and challenges. Help me Father to have an eternal perspective. Help me to see my disappointments in light of what Jesus purchased for me at the cross. Help me to seize those disappointments as opportunities to draw closer to you and not away from you. Help me to learn from them. Help them to shape me more and more into the image of your Son. Help me to see Jesus in them and to see his love and grace for me. I want to maintain the tension between knowing why there are disappointments and knowing that they will one day come to an end. I want those disappointments to drive me to you. Help me to hunger and thirst for you, more than for anything else. Help me to see that only you can comfort my disappointed heart, only you can fill up my emptiness, only you can give me the joy I long for. Holy Spirit, strengthen me for this fight. Give me gospel joy even in the midst of failed expectations. Prompt my mind and heart to always remember Jesus, the Man of Sorrows who conquered sin and death to bring peace to the chaos, healing for the broken, and forgiveness for sins. A couple of weeks ago I traveled out of state to speak to a group of ladies on the topic of my forthcoming book. My talk was titled, The Lost Art of Lament. I spoke about the difficult and hard emotions of life such as fear, sorrow, worry, and abandonment. I shared how God's word shows us how to give voice to those emotions, how to cry out to him for help, and how his word reshapes our emotions for his glory as we go through the process of lament. It was a fruitful time of ministry and serving the ladies of that church. The night I returned home from my trip, my grandfather had a massive stroke, fell, and broke his hip. After receiving the news, we drove three hours away to visit him in the hospital. I wept when I saw him lying on the hospital bed, weak, frail, and helpless. Our family cried and prayed together. I spent that week saying my goodbyes. My grandfather ended up going into hospice care and passing away within the week. All too often, the things I write about are things I am working through in my own life. And learning to lament is no different. The irony did not escape me that I had just taught a group of women the art of lament and now I would have to apply the very same things in my own life. Loss hurts more than any physical pain ever could. I knew one day I would face this loss and I also knew it would hurt. It hurt more than I imagined. But through studying and writing about the laments, I also know that there is hope in the midst of my heartache and loss. For the believer, joy is often intermingled with deep sorrow. Like the writers of the laments in Scripture, I know that God is my fortress, my deliverer, and my salvation. I know that he listens to my cries and catches all my tears. I also know that through Christ, though weeping will remain for the night, joy comes in the morning. But I know that I must come before you. I know the only cure for this despair and sorrow I feel is to be in your presence. The psalmist wrote that in your presence there is great joy. I am clinging to that promise with a white knuckled grip. Just as the psalmist cried out to you from the pit of despair, I too pour out all these thoughts and feelings at your feet. My heart hurts. My eyes sting from the steady flow of tears. My mind is filled with memories of times past, making my heart ache all the more. I need you, Lord. I need your help. I need your strength to get through even the very next moment. Forgive me for the ways I have not glorified you in my grief. I know that this sorrow I feel is not wrong, for Christ shed tears of grief at his friend Lazarus' tomb. But I also know that in my sorrow I have had sinful thoughts and feelings that I need to confess. Create in me a clean heart, O Lord. In the midst of this darkness, help me to see your light. I know that you are familiar with grief. I know that Jesus was a "man of sorrows" who "for the joy set before him he endured the cross, scorning its shame, and sat down at the right hand of the throne of God" (Hebrews 12:2). He did that for me so that I could become your child. Thank you, Jesus for suffering and bearing my griefs. Thank you for taking on my sin. Thank you for making a way for me to come into the Father's presence. And thank you that one day, you will return and bring an end to all sorrow and weeping. Oh, how I long for that day! Maranatha, Lord Jesus! I know that you are always with me and that your love never ceases. Help me to find refuge in you and no where else.